A temperature gun or infrared thermometer is a device that measures the temperature of whatever the gun is pointed at. Today, most temperature guns have a laser indicator that shows exactly where the temperature is being taken. Besides the fact that they’re shaped like a gun and have a built-in laser, infrared thermometers are just plain cool. They’re very fast (instantaneous), provide a good indication of temperature and allow you to collect data at a distance. The laser pointer in an infrared thermometer is a guide that indicates where you’re pointing the instrument. When measuring the heat coming from an A/C duct (for example), the laser helps to steady your aim and ensure that you’re close to the area you’re trying to temp. An infrared thermometer is a surface temperature tool, but not all surfaces are created equal. Depending on what you’re pointing your infrared gun at you’re likely to get variations in emitted infrared energy. This variation is called emissivity. Emissivity is a measure of a materials ability to emit infrared energy. It is measured on a scale from just about 0.00 to just below 1.00. 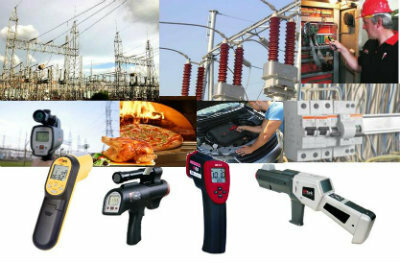 No matter what you want to measure, there is a temperature gun for your trade or needs.